Goodreads: All children’s book illustrator Claire Turner ever wanted was to be a mother. After six years of trying to conceive, she and her husband, Josh, have finally accepted that she will never be pregnant with a child of their own. Kritters Thoughts: Another home run for Steena Holmes. From series to stand alones, I have loved reading Steena Holmes for awhile now. This book focuses on a couple who have had difficulties conceiving and when a miracle happens they are excited to celebrate; of course, their joy can't last long or what would be the book! Claire is diagnosed and this couple must face some extreme decision making. First, I loved this couple - they felt real and authentic, yet not completely flawed or dramatic. I also loved the people that they were surrounded by; each character added something to the story instead of just being there. The secondary characters are both a part of the main story, but also have their own that doesn't detract from the main but supports it in just the right way! I didn't love the ending for this one and I will of course not divulge any details, but that didn't take away from me overall loving the book. I would absolutely have picked a different ending, but can live with the one Steena chose. I am anxiously awaiting her next release! 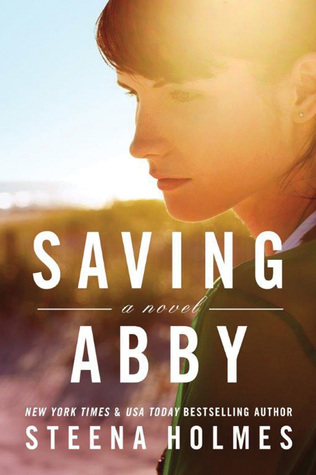 I'm so glad you enjoyed Saving Abby :) Thank you for posting your review! I haven't read one book of hers that i did not Love, from beginning to end!!! I bought it yesterday but haven't started it yet. It sounds great! Love Steena Holmes writing! This book sounds like a real tear jerker. Can't wait to read it. Just love Steena this book is on my to get list. I just can't wait to read and review love reading the reviews about it. You can't go wrong with any of her books!!! LOVED this book...I think it's my new favorite story from Steena.